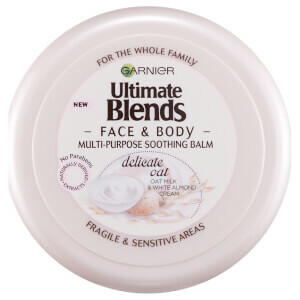 Pamper and unburden skin with the Garnier Body Ultimate Blends Delicate Oat Milk Lotion. Tailor-made for the fragile areas on the face and body, the light, comforting formula actively targets sensitive patches to help to restore the skin with an even surface complexion, working diligently to ensure optimum purity. Massaje delicadamente na pele, conforme necessário, garantindo uma cobertura uniforme. Use diariamente para melhores resultados.